Explanation: The Phoenix lander's footpads are about the size of a dinner plate. One of three is shown at the right, covered with Martian soil after a successful soft landing on the Red Planet on May 25. 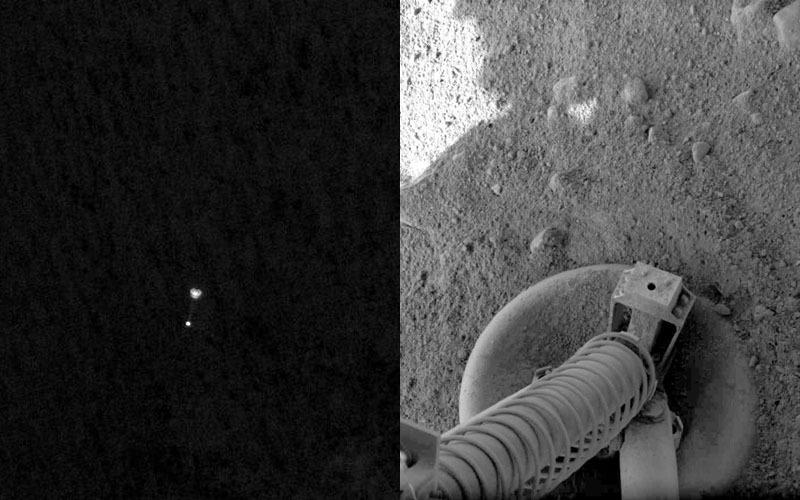 Amazingly, the left panel image is of the spacecraft during its descent phase, captured by the HiRISE camera onboard Mars Reconnaissance Orbiter -- the first image ever of a spacecraft descending to the surface of another planet. Taken from a range of 750 kilometers, the picture shows Phoenix suspended beneath its unfurling, 10 meter-wide parachute, against the much darker Martian surface. The lander is still attached to its protective backshell. Phoenix released its parachute at an altitude of 12.6 kilometers. Using rockets to further reduce its speed for landing, Phoenix now rests in the northern polar region of Mars at about 68 degrees latitude.